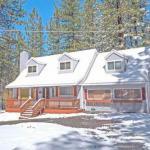 Needle Peak Road Holiday home is set in South Lake Tahoe a 13-minute walk from Heavenly Ski Resort 1.5 km from Tahoe Queen and 1.8 km from South Tahoe Ice Arena. The property is 9 km from Washoe Meadows State Park. Popular points of interest near Needle Peak Road South Lake Tahoe include First Ride Gunbarrel Express and Aerial Tramway. The nearest airport is Reno-Tahoe International Airport 65 km from the accommodation.